Our hotel, located at the centre of Sultanahmet / Old City offers the high quality service and atmosphere with 28 quality rooms. Daily breakfast is served in buffet style. Guests can enjoy their breakfast in the privacy of their rooms. Local restaurants, bars and cafes are within a 2-minute walk away. You can enjoy laundry and room service at Nowy Efendi Hotel. There is also a little patio in the back to relax and socialize. Carpeted rooms include air conditioning, minibar and an LCD TV with satellite channels. The private bathroom has a hairdryer, free toiletries and slippers. 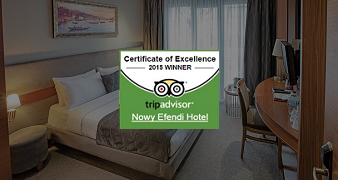 Nowy Efendi Hotel will provide all the comfort you need with its exceptional service quality. 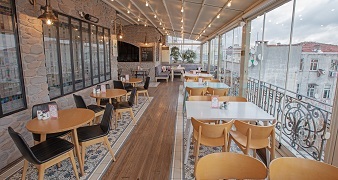 You may enjoy your drink or meal with a great city view of Istanbul on our terrace. Thanks to our guests for recommending us on leading travel websites. Our mission is to make our every guest happy and to deliver standards beyond the level of expectations.